Wing span: 1 5/8 - 2 1/4 inches (4.2 - 5.7 cm). Identification: Upper surface of male bright yellow with pale yellow at wing bases; wings edged by narrow black border crossed by yellow veins; cell spot small. 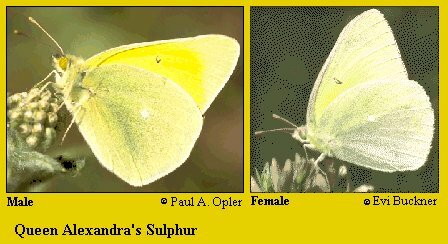 Female yellow, sometimes white, with forewing border faded or absent. Underside of hindwing of both sexes green-gray; cell spot white with no surrounding ring. Life history: Males patrol open areas for females. Eggs are laid singly on top of host plant leaves, which the caterpillars eat. Late-stage caterpillars overwinter. Caterpillar hosts: Various plants in the pea family (Fabaceae) including milk vetch (Astragalus), Lupines (Lupinus), and clover (Trifolium) species. Adult food: Nectar from flowers including blanket flower, milk vetches, and others. Habitat: Road edges, fields, meadows, sagebrush flats. Range: British Columbia south and east to eastern California, Arizona and New Mexico.